The Changing of the Guard at the Parliament Building at Syntagma Square in Athens is a fun bit of pageantry worth watching if you find yourself in the area at 11 a.m. each morning. The special military unit, called Evzones, of the Hellenic Army, stands perfectly still before changing positions in front of the Hellenic Parliament. The "big" show is on Sundays at 11 a.m., when more guards participate in wearing the official costumes and perform a more complex ceremony. While not as dramatic as that "other" Changing of the Guard in London, England, it is fun to watch the synchronized movements of the costumed guards. The guards are carefully selected for the honor of participating, and most of them are very tall, averaging over six feet, three inches in height. They are very physically fit and are chosen for their strong character. They go through rigorous training for one month, learning to keep their body and mind still. The guards also learn to keep their faces expressionless, and eyes and face motionless. 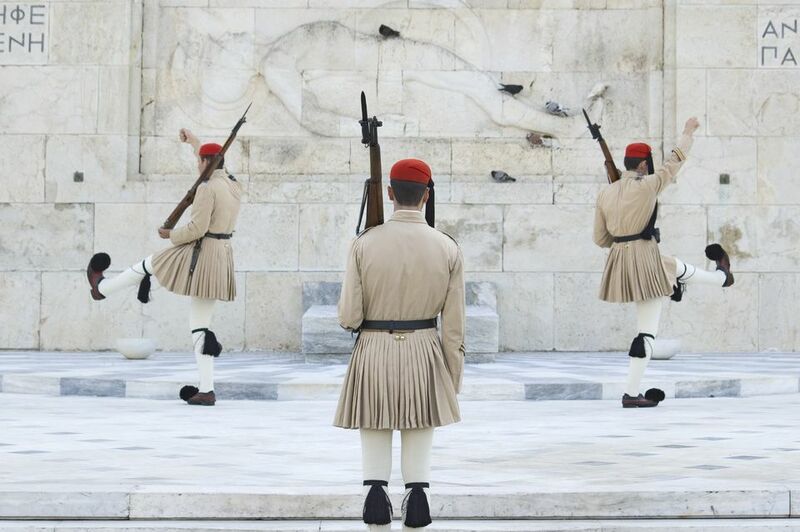 Members of this special unit (Evzones), also called Tsoliades, guard the Monument of the Unknown Soldier which sits in front of the Parliament Building and Presidential Mansion. The evzones represent courage and bravery in Greece. Formed in 1868, this unit has taken on several names throughout the years--today it is called the Presidential Guard. After standing perfectly still for one hour, the guards change positions in pairs, the two guards synchronizing their movements, carrying them out as if in very slow motion. This measured pace protects their blood circulation after being immobile for 60 minutes. The guards repeat this ritual three times within a 48-hour period. On Sunday, the ceremony is a bit more intricate, with the guards wearing a more showy costume. The evzones wear one type of uniform during the week, and then another that is more striking on Sunday. The uniforms of the evzones recall different areas and eras in Greek history. The weekday costume is reminiscent of the soldiers of the Macedonian Struggle (1904-1908), whereas the Sunday garb may stretch back four thousand years into ancient Minoan times when the kilt was the common clothing item of Cretan men, usually enhanced with a large dagger stuck into the waistband. Along with the pleated kilt, or fustanella, the costume also consists of a hat (phareon) with a black tuft, a white shirt with loose sleeves, the phermeli (the waistcoat) and pom-pom decorated footwear (tsarouchia). Fringes, garters and a belt are also part of the ensemble. Each guard also carries a gun, which is quite difficult to carry because of its weight as well as the pressure it applies to the soldier's body.